Self Dumping Hoppers & Light Duty Steel Dump Hoppers by Koke Inc.
Industrial space has a lot of challenges and you want to have the right equipment to make your operation run smoothly. 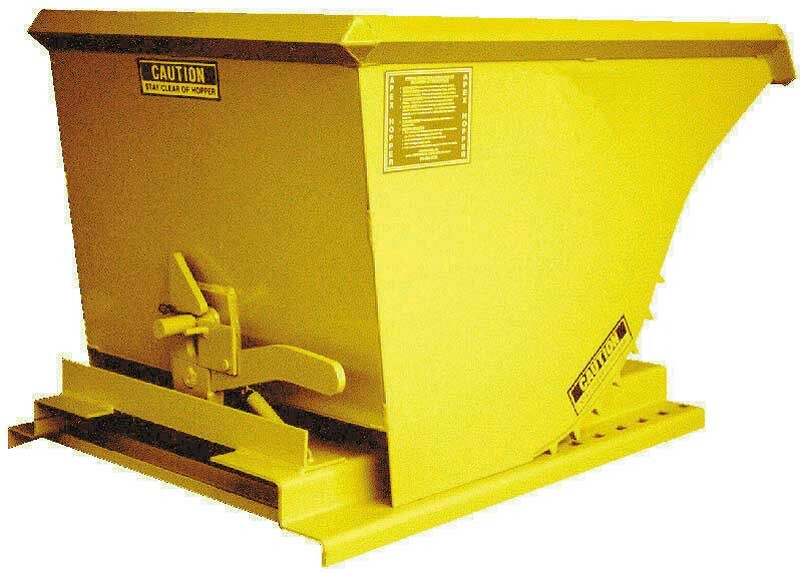 When you are maintaining a plant or trying to keep your job site clean, try a self dumping hopper. These low-cost units help collect, store and transport bulk materials, and it’s easy for a forklift operator to transport them by sliding forks into their built-in fork pockets. Once it has been moved to the right location, release the safety latch and the hopper will tilt forward and release its content. Then, the self dumping steel hopper will return to its locked position and it can be reused for another load of materials immediately. Each steel hopper is constructed out of 3/16” plate continuously MIG welded and re-enforced with angle throughout. All edges are rounded smooth for safety. Exclusive 5/8” rocker gear with 1” flame cut “S” stop. Features no pins or rivets to work loose. Sizes range from 1/4cu.yd. to 5cu.yd. With option such as casters and enclosed fork pockets, you can customize these hoppers to suit your needs. Make sure you have the right tools for the job and follow proper safety techniques for operating a self dumping hopper.